Latest TORT ep coming in yo face! ....Hmm, perhaps a bad choice of words. Tom and Kuro tag team an odd assortment of topics that include the most popular of which, DENTISTRY! ...NO WAIT! IT'S A GOOD EP, I PROMISE!!! 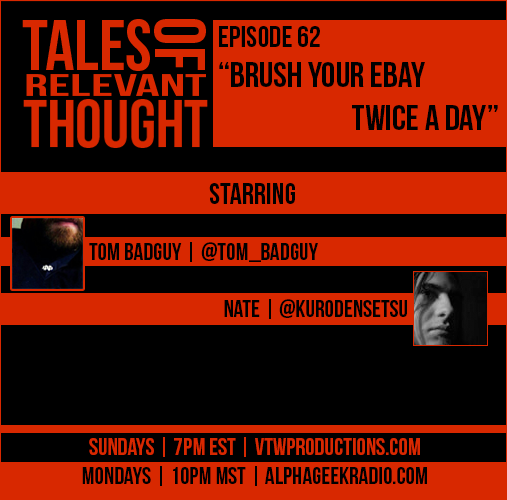 Also, in depth talk about strategies on eBay and all the things that piss us off about sellers. AND, Kuro starts the show by attempting to find news in regards to Hideo Kojima, will he find something before the show ends?! You'll have to listen! This and more, enjoy!